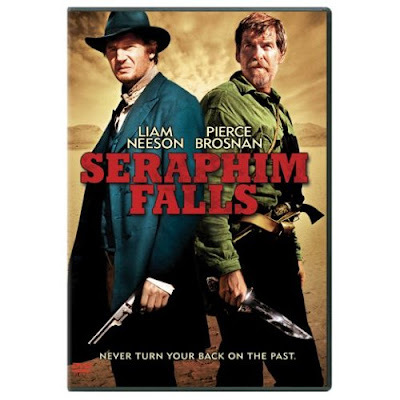 Seraphim Falls made only a fleeting appearance in a handful of theaters a couple months ago. But if you missed it, don't fret: Director David Von Ancken's gritty Western, starring Pierce Brosnan and Liam Neeson as Civil War veterans who wage their own private war on each other, will be released May 15 on DVD. By the way: Brosnan evidently enjoyed making the flick -- he's now talking about making "an all-Irish Western" with fellow actors who hail from the Emerald Isle. Faith and begorrah, maybe Gabriel Byrne and Colm Meaney will be ropin' and ridin' alongside the former 007.